The Scottish government is to bring forward legislation to provide an opt-out system for organ donation. Public Health Minister Aileen Campbell said there would be legislation for a "soft opt-out" system, aimed at increasing donation rates. A government consultation found 82% of respondents in favour of the move. MSPs considered such a system during the previous parliamentary term, but ultimately rejected it due to concerns over some specific details of the plan. At that point ministers said there were "merits" to an opt-out system, and launched a consultation with a view to pursuing their own legislation. More than 800 responses were gathered, including a petition with 18,500 signatures backing the move. The British Medical Association (BMA) has also endorsed a soft opt-out system. At present, anyone who wants to donate their organs after death currently has to "opt in" to the system through the donor card scheme. Currently, 45% of the Scottish population have joined the register. 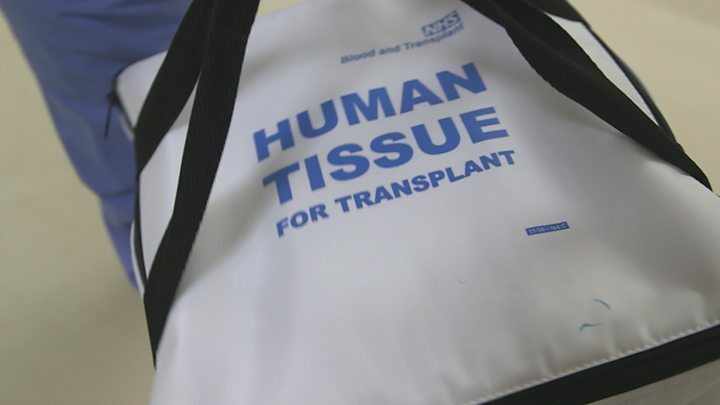 A soft opt-out system - like that introduced in Wales in 2015 - would allow parts of an adult's body to be used in transplants in the absence of express permission. However the wishes of families and next of kin would continue to be respected, so removal of organs would not go ahead without their support. Ms Campbell said the move was intended as part of a "long-term culture change in attitudes", with a "package of measures" expected from the government. She said: "I can confirm that we intend to bring forward legislation to introduce a soft opt-out system. "This will build on the significant improvements already made as a result of the donation and transplantation plan for Scotland. That progress is testament to the great many people who work tirelessly to facilitate organ and tissue donation and transplantation. "We should not forget that organ donation is a gift, which can only occur as a result of tragic circumstances and every donor and their family has made a selfless decision which has enabled others to live. "We need to continue doing what we can in order to help reduce the numbers of people in Scotland waiting for transplants. Moving to an opt out system of organ and tissue donation will be part of the long term culture change in attitudes to encourage people to support donation." BMA Scotland welcomed the move, with chairman Dr Peter Bennie saying the field of organ transplantation had "not yet reached its full life-saving and life-transforming potential". He said: "The whole transplant community has worked tremendously hard to increase donation rates but we believe that more can be done. "As doctors it's difficult to see our patients suffering and dying when their lives could be saved or dramatically improved by a transplant. We look forward to contributing to this important legislation." Former Labour MSP Anne McTaggart, who brought forward the member's bill in the previous parliament, said she was "so pleased" that the government had "finally seen sense". She said: "This legislation could have been passed more than a year ago but sadly petty party politics blocked a change in the law at the time. That failure has cost lives. "This turnaround is to be welcomed and I am ecstatic for all those awaiting transplants, organ donation recipients and their families today."